Please select the correct Celebrity, Adjectives, Nouns, Adverbs and Verbs to complete the sentence. 21. 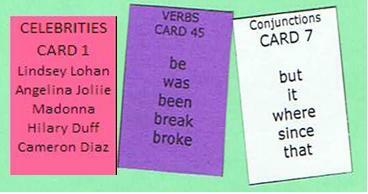 By the mid-1990s, (CELEBRITIES CARD 5) had (VERBS CARD 75) (PRONOUNS CARD 5) as one of the best-selling artists in the world. 22. (CELEBRITIES CARD 7) got married to Michael Douglas, who (VERBS CARD 39)-s the same birthday as her, and is (ADVERBS cARD 20) 25 years her senior. 23. (CELEBRITIES CARD 1) has (VERBS CARD 45) married with hockey player Mike Comrie (conjunctions card 7) August 2010. 24. 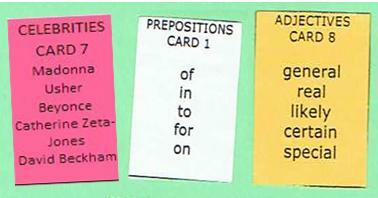 (CELEBRITIES CARD 7) has splashed out $100 tips (PREPOSITION CARD 1) a (ADJECTIVES CARD 8) sandwich. 25. (CELEBRITIES CARD 3) showed (PREPOSITION CARD 5) her generous (NOUNS CARD 9) by donating to a California children's charity. 26. (CELEBRITIES CARD 6) and son (VERBS CARD 68) the golden popcorn for the Best Male (NOUNS CARD 42) in 'I am legend'. 27. After the movie Day and Knight (CELEBRITIES CARD 6) praised (CELEBRITIES CARD 1) stating that "she is (ADJECTIVES CARD 33) and a lovely person to work (PREPOSITION CARDS 10)"
28. 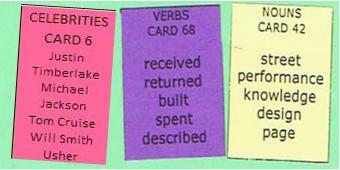 (CELEBRITIES CARD 5) said that divorce (VERBS CARD 55) ten times more (NOUNS CARD 50) than marriage. 29. In 1999, (CELEBRITIES CARD 4) starred in the movie " the Matrix". The film was a box-(NOUNS CARD 18) (NOUNS CARD 44). 30. (CELEBRITIES CARD 3),(PREPOSITIONS CARD 1) her performance in "All about Steve", (VERBS CARD 52) the Oscar. The day (PREPOSITIONS CARD 4), she won a Razzie award too. Sandra is the (ADJECTIVES CARD 5) performer who has (VERBS CARD 52) both awards during the same year.